When I think of a Bible translator, I think of a nerdy scribe hold up in a dark tower somewhere inconspicuously taking a text from Latin or Greek and meticulously changing it to another language. This is most certainly not the case for William Tyndale. He was a die hard reformer. He translated the Bible into the common man's language under threat of death from the Catholic church that most certainly did not want God's word in the hands of the every day man. I have a newfound respect for the lengths this man went to so that you and I could apply the salve of God's word to ur individual wounds. The church at the time held complete control of the scripture. They forced everyone to believe as they did. Refusal to do so would get you burned at the stake. Tyndale was the first to translate much of the Bible from the original languages. He printed his illegal Bibles as an outlaw on secret presses. He was poor and always moving around to avoid the authorities that would rather see him dead. He stood up against the false ideas of the Catholic church. He wrote that Christ was not actually present in the sacriments and that purgatory was nothing but a medevial cash cow. As you can imagine, this man made a lot of very important people mad. In 1536, he was betrayed, imprisoned, and tried for heresy. He was then choked, impaled, and burned at the stake. Puts a whole new light on the Bible in your hand. William Tyndale was definitely called by God for this task. No ordinary man could have survived under the intense pressure and threats. He must have been empowered by God to endure to the end. Secondly, was he deep desire to understand Greek and Hebrew. He studied relentlessly and came to see how Hebrew could help him unlock the Greek text. He found a rhythm in scripture and was able to make the poetic undertones come alive by translating it as directly as possible. Many of our English words were original to Tyndale who coined them while translating scripture. THe 54 scholars who translated the King James Bible in 1611 relied heavily on Tyndale's translation. Some scholars say that the Old Testament is 76% Tyndale's and 83% of the New. He spent decades spilling over these words for us, even spending seven years just on getting the perfect adjectives to describe the text. I was amazed by this story and the depth and insight that the author gave to us. 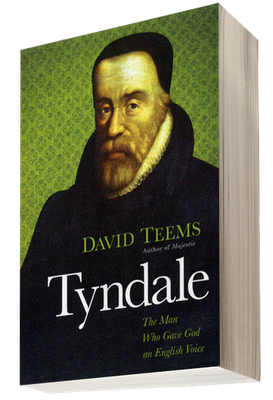 He showed so many dimensions to how God used Tyndale's adversity to forge him into the man for this task. David Teems is a brilliant and eloquent of pen. I highly recommend this book.